I’ve been planning to upload a track by the Rotorua Maori Choir since April of 2008, when I posted a song by a Lithuanian choir. Besides the fact that I truly enjoy today’s piece, it brings up a number of issues which, while I can claim no expertise in discussing, I feel obliged to address nonetheless. So, the ruminations in this post are sort of a continuation of April’s thoughts. There was very little so-called “ethnic” music recorded in either Australia or New Zealand during the 78rpm era. I know of a set of ethnographic recordings of Australian Aboriginal music made by the Australian Broadcasting Commission, but I’ve not once seen a copy. It may have been pressed as a limited edition. 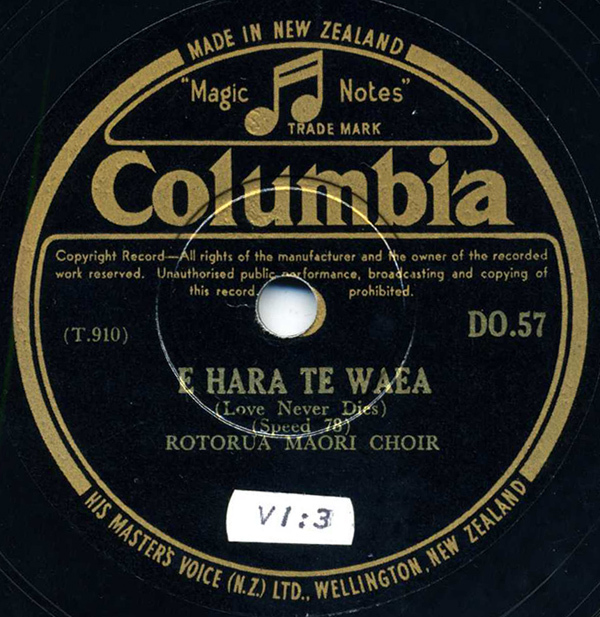 As for commercial releases, there were several sessions of Maori music from New Zealand dating from the late 1920s/early 1930s, on Parlophone and Columbia. The first recordings were by the singer Ms. Ana Hato and her cousin Deane Waretini. While ostensibly traditional Maori songs, they had a distinct Western bent. Both were trained as singers by westerners, and the songs they recorded were accompanied by piano – some were written by non-Maori songwriters. Despite this, Ana Hato had said that they sang “as Maori, not pakeha” – the latter being the Maori term for New Zealanders of European ancestry. Their recordings brought Maori culture and music to a larger audience, making the duo legendary and their music beloved. The same can be said of the Rotorua Maori Choir, who formed in the early 20th century and recorded at least 30 songs for Columbia in April of 1930. The recordings were engineered by Reg Southey, and the music was conducted and directed by Gil Dech, a music director for Columbia. It’s been documented that it took an entire three months on the Columbia docket for Dech to learn the Maori songs, rehearse the choir of about 30 members, record the wax masters, and wrap up the sessions. Nearly all the tracks are solely choir, without piano. The group rehearsed in the Tamatekapua meeting house at Ohinemutu, often until 2AM, when they would make a recording. According to an article in Te Ao Hou, a magazine published by the Maori Affairs Department in New Zealand, Dech would let the choir harmonize naturally…except when he felt the need to step in, as when the group were singing in unison. The recordings remained in print for years, eventually making it onto LP almost three decades letter. None are in print now. So, I give you the Rotorua Maori Choir with E Hara Te Waea, or “Love Never Dies” – as good a sentiment as any to kick off 2009. One of the most interesting stories you’ve ever posted. Thanks again Jonathan! Thank YOU for continuing to stop by! Lovely track, and your points were well said. wow. what an enchanting side, and a great bit of research. enjoyed the meeting photo hut, too. i agree, the side is steeped in maori flavor nonetheless. the music on your site reminds me to sit back, close my eyes, and just listen. Thanks, Tony! I’m glad you liked it. Thanks for your great site and making available these tracks. The Atoll label has also released more historical Maori music sourced from radio and private recordings. I did not know about these CDs – thanks very much for your comment and the update. I will add those CDs to the Resources page. I’m not sure if you know about Alfred J. Knocks – he recorded Maori and Rarotongan music in New Zealand around 1909. Percy Grainger, who was was one of the first collectors of folk song to use a phonograph in the field, tracked Knocks down and copied those recordings. They are now in the Grainger Museum collection, along with copies Grainger had made by the Library of Congress. The National Film and Sound Archive has since transferred the recordings to a digital format. The collection also holds correspondence between Grainger and Knocks about the recordings. If anyone reading your blog is in Melbourne they should visit the museum where they’ll see Grainger’s folk song collecting phonograph, wax cylinders, his notebook containing lyrics, hand drawn maps, photographs and more. I enjoy your site, it’s always interesting. Grainger had a great deal of respect for fellow collectors, from professionals to amateurs, and he was very fond of Knocks. He was first introduced to Maori music by an artist, A. E. Aldis, when he was very young, and it was a profound experience. Very interesting! Thanks very much for taking the time to share that, Monica! No problem, I work at the museum and it’s a real privilege to have access to the folk song collecting material in the collection. I’m always happy to share information with anyone interested. Hello! My name is Anneli Drecker. I am a singer/composer/recording artist from Norway. I have beed an artist since the mid 80-s, recording several albums. I have a new cd project going on and I would like to involve a maori choir singing on one or two of my tracks. The project is poems about the sea with music composed and performed by me. I will be in Auckland on the19th and the 20th of january 2012 and was wondering if you could perhaps help me getting in contact with a choir over there? Thank you so much for this lovely song. It is really beautiful. I stumbled across it whilst searching for an earlyish version of Po Ata Rau. If anyone can point me in the right direction to find an adult choir version of Po Ata Rau I would be so pleased. It was my mother in law’s favourite and the family hoped to play it at her funeral on Tuesday 9th April – so not much time. If anyone can help I would be so so grateful. Thanks again for this so lovely song.